Long-time Apple supplier Inventec has been selected by Apple to churn out Apple's rumored Siri speaker, if supply chain reports out of China are to be believed. In a new report published on early Wednesday by the Economic Daily News, the Taiwan-based company has garnered orders for production of the speaker, which may have already started. However, if the company is on tap for component production or assembly of the device isn't clear. Inventec currently produces Apple's AirPods, and has been involved in the Apple product pipeline in some fashion since the iPod days. If the report is accurate, Apple's primary assembler and Amazon Echo builder Foxconn hasn't been selected to build the product. Rumors about the device started circulating in late April. the Siri speaker will reportedly feature one woofer and seven tweeters for rich sound. It's also believed that it will be powered by a custom ARM processor equal in power to at least the A8 CPU on the iPhone 6 or newer, and have the W1 Bluetooth chip as well. KGI Securities analyst Ming-Chi Kuo believes that Apple could ship as many as 12 million units a year after launch date. If successful, Kuo believes that the line will expand, similar to what Amazon has done with the Echo. Physical details about the enclosure were shared by prolific leaker Sonny Dickson. Dickson claimed that the speaker superficially resembled the UE Boom fused with the cylindrical Mac Pro, and will have a concave top with physical controls on top. Kuo believes that there is a 50 percent chance that the device will make an appearance at Apple's Worldwide Developer's Conference, taking place June 5 through June 9. But, as of yet, no diagrams or components have been "leaked" from assembly points. I tried an Amazon Alexa device when I was out house hunting a couple weeks ago. Note to home sellers: I could have ordered a bunch of stuff for you. The general idea behind these devices is pretty good. I am sure Apple will make some sweet hardware, hopefully at a price that isn't so premium it doesn't make sense. I do use Siri a bit on my phone, mostly to look up trivia, set cooking timers, and to schedule appointments. I surely don't use all the capabilities but it's hard to know what the capabilities are. Check that. I asked Siri "What can Siri do?" and got a list of things I mostly don't want Siri to do. There are a few more uses for Siri I ought to try. Siri doesn't seem to work that intelligently. I never use it on my Mac. Is this the same Siri that will be on Apple's Alexa competitor? I hope Apple will give us a simpler, more intelligent Siri with this device. Otherwise, they need not bother. I choose to believe that this new device will break the barrier of what current devices can do, with a lot more on-device processing of voice commands, and less dependence on internet and data centre communication. That will make it faster and more natural to use. And then Apple will bring that same breakthrough tech to the iPhone, iPad, the Watch and the Mac. I'm sure Apple has been working on Siri and it will NOT be exactly as you see it today. Typically, Apple specifically modifies a piece of their technology to work specifically with a product its intended for. So, in the case of this speaker device, they'll engineer Siri to work directly with it. They did the same thing with Siri when it came to AppleTV. There were (and they're still adding) specific things you can ask Siri to do that you can't on other Apple devices. BTW...I too have yet to use Siri on the Mac and in fact I have it disabled. I simply don't see it as being useful and I was sick and tired of accidentally activating Siri all the damn time! I surely don't use all the capabilities but it's hard to know what the capabilities are. Check that. I asked Siri "What can Siri do?" and got a list of things I mostly don't want Siri to do. There are a few more uses for Siri I ought to try. Siri doesn't seem to work that intelligently. I never use it on my Mac. My friends have an Echo and I'm not particularly impressed by it. It sits in their kitchen and is basically useless outside of there. Music sounds decent through it and it seems to "hear" fairly well. But when they were demoing it for me it didn't work well. It managed to give tomorrow's weather and the score of the previous day's game but when they asked it to play music it kept playing the wrong artist or incorrect genre. And it got really confusing when they would both accidentally speak to it at the same time. Currently, Alexa is less capable than Siri in a number of ways, like follow-up questions and more detailed answers. If you have an iPhone you can also invoke Siri, not say anything and then get a continuously updating list of what Siri can do. I have found some uses for Siri on the Mac. I find it very convenient to say to Siri "Show me photos of (my daughter) from May 2015" and Photos opens and shows me my daughter's photos. Super! I'm mildly disappointed that Mac Siri cannot currently handle HomeKit requests, even though it is apparently aware that I'm making a HomeKit request and is aware that it can not follow through. Again, these are things I use daily or quite frequently (the tax and tipping less so) and work every time. Siri also works great on the follow-up questions (like, who is the President of the United States? How old is he? Does he have children?) but I do those types of things less frequently. I'd like to know what it is you try to use Siri for that doesn't work to your satisfaction. It seems the things you asked Siri are mostly related to the iPhone. I do not use Echo. But I think Echo can answer more things unrelated to the device. I don't use Siri anymore. It's a waste of my time. Over half of what I ask it is either wrong or it pulls up a list of list of suggestions that I refuse to navigate through while I'm driving. It'll be interesting to see if they add "Hey Siri" style voice recognition and allow per-voice restrictions on functionality. Personally, I don't think these type of things are to useful. It's locked into a room so you have to buy 2,3,4 of them placed around the house. Apple already has their device, a Trojan Horse you could say. It's called the Apple Watch!!! See it's with you where ever you go. Not tied into place by a power cord. No need to pull out your phone. No need to touch the watch either. It really works great for me and rarely screws up. At any time I can say Hey Siri and issue a command. Set a timer, a Reminder, a Appointment, tell a joke. Ask when the Giants play next and it'll give me the info from MLB.com. The time, who they play. I just asked "How to you spell Trojan, and it gave me the spelling and Dictionary Adjective and Noun of it. There's built in Homekit support. So you can get Homekit supported devices to turn on /off lights. Adjust the temp if you have a Ecobee 3. In a couple months, Chamberlain will support Homekit for their MyQ devices. If you have one of their MyQ devices already, a $50 bridge is all you need. Right now I can open and close my garage door on my Apple watch with a app. Soon I can just go Hey Siri, Open garage door. Try doing that with a Echo. You can't unless you were inside your house next to the thing. You can turn on/off lights outside of your house or away from your house. I like that Siri is quite. It never speaks. It shows you everything it needs to on the screen. The Echo has to speak everything because there's no screen, you may not be next to it. I don't think many people realize what the Apple Watch can really do. Some may have it, but use it at the most basic level. Siri also has a bad rap but Apple is continuously working on it. It hasn't stayed stagnate all these years. As long as you speak clear and not FAST it works great. Slow yourself down just a bit then how you would talk to a real person. You'll have better results. A computer is not quite as forgiving as a Human. It really is amazing how well Siri on the Apple Watch works. I use it far, far more on it then on my iPhone. I haven't tried it, but I should be able to control the TV also through the AppleTV as it supports Homekit. I haven't tried it. I'm always learning how to do new things. My the way, Siri on the AppleTV works great also. I think it's easier and faster to use Siri to enter login name, password the doing the dumb scrolling back and forth over the letters/numbers to enter things. Apple acquired technology that is years beyond the competitors. Maybe they're waiting to unleash it for a new product or at least iOS 11. Sonny Dickson claims Apple will be announcing major improvements to Siri at WWDC. I hope so. Hopefully improvements to proactive too. I don't understand the part about "mostly related to the iPhone." How do you mean? And all of the things mentioned can be handled by my Apple Watch, as well. My experience with Echo is also somewhat limited, but what do you think Alexa can answer that Siri cannot? This kind of crap happens all the time. For instance, if there is a list, you can't just say "the second one." Simple stuff that should be included. Althogh vocal IQ sounds amazing, so did Siri. I don't see how making Siri do more complicated tasks (and finally, actually achieving meaningful contextual continuity) will help if Siri still struggles so much with parsing basic, small deviations from its set script. FWIW my perspective is purely from a 'normal' use case. 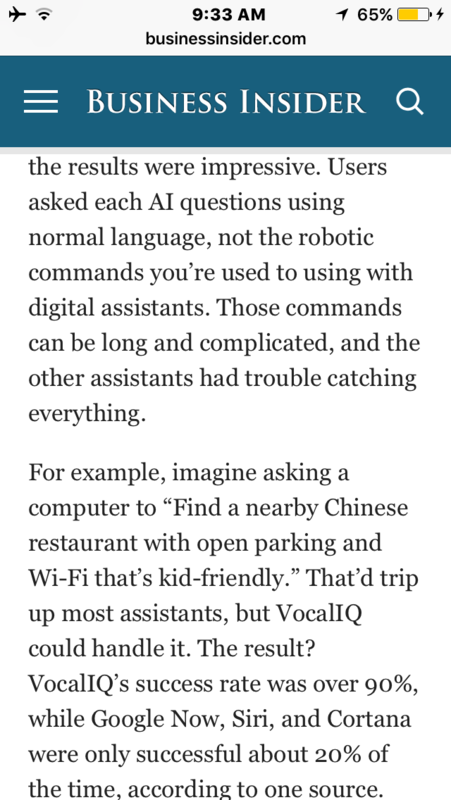 I'm not a 'techie', but if I run into a roadblock with Siri I'll try a few work arounds (which is probably more than what the average user is willing to do), which seem pretty logical and straightforward to me, but they almost never work. Apple's hardware and core software is so excellent. I don't understand how Siri is still so damn frustrating to use. Especially since this has been a widely talked about issue for a while now. Mossburg even wrote an article on it that got a lot of attention. I wish this were true for me. When I issue HomeKit commands to my AW Series 0, it chugs and chugs. With messages like "Communicating..." and "I'll tap you when ready..." for reasons I don't understand. The same commands to my ATV remote are instantaneous and are the most responsive way to trigger HomeKit scenes that I've used yet. Yeah, this type of follow-up stuff is maddening. Apple does indeed have big plans for Siri and all its underpinnings. In fact, there is a lot already threaded through iOS. I hope they unleash it very soon and don't wait for Workflow integration. An article on BackChannel went in-depth last August. How maddening? Would you like it reads a whole list to you? It says "tap", not "talk". This is not a Siri problem but a UI problem: whether a list should be read or showed to the user. Is there any other way to choose an item from a list? How would one choose an item from a spoken list? By shouting "yeah, this one, no, not that one, the previous one" ?.. I hate to post so many negative comments recently, but I had the same experence regarding Siri on the Mac. Turned it off almost immediately and Siri on my iPhone goes almost unused, save for the occasional timer. Siri has really not lived up to the promises. Siri is far more limited in what it can do, but after trying to use an Echo Dot for to weeks now, I find it's far more reliable than the Dot. Siri does get some things wrong and occasionally fails to parse what I say correctly, no matter how clearly I speak. But Siri also understands far more many ways to express a command/request than Alexa. 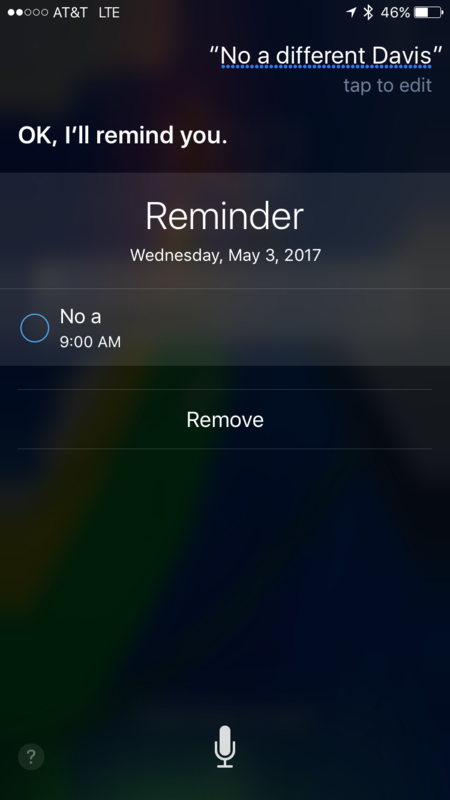 If Siri has a problem completing a command/request, there's usually a cue, clue, or explanation. Alexa frequently a) doesn't respond b) responds with the rotating blue LED then stops or c) responds with the rotating blue LED then stops, then after a time gives a rotating red LED or d) responds with c and then says something like 'your Echo Dot has lost connection'. Alexa will then not respond for some period of time. Sometimes after being told that the Dot has lost connection, I can immediately ask 'Alexa, are you connected?' and it will say 'yes' and immediately fail another request. The inability of Siri to deal with followup questions is very frustrating. Siri handle's them with Contact's phone numbers 'Which one?' just fine, but fails in all other areas. If I say 'Take me to Costco' I get 'Which one?' and am shown a list. I can tap my choice but if I say 'the second one' I get nada. Frustrating. I got the Dot to supplement Siri, and also to have an 'always on' digital assistant so that I don't have to keep my 5s or iPad plugged in. I also really dislike the 'Hey Siri' thing and wish it were just 'Siri...' And can hear much better than Siri, even if she cooperates far less. But on big red flag that I've so far ignored is that Amazon demands I save my WiFi password to it's servers so that 'it can automatically reconfigure my Echo network in the event of a failure'. That should be opt in, as there's no need for Amazon to store it. So I'm disappointed by Alexa and have a greater appreciation of Siri. I want both to improve markedly, but will dump Alexa when Siri gets better.